The following blog will be a continuation of the previous one, summarizing and discussing the main points made by ED100 (ed100.org), a free online course that breaks down California’s education system through ten easy-to-read modules. Module 2 focused specifically on students, the problems they face, and possible solutions to those problems. 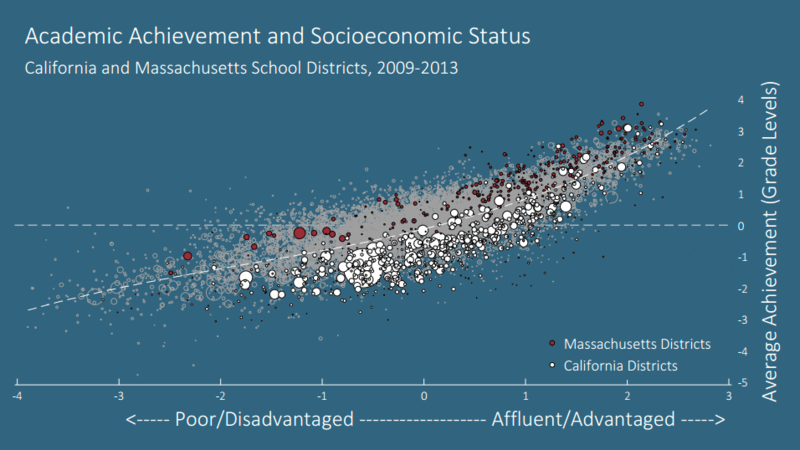 Poverty correlates very strongly with educational results (ed100.org/Achievement-and-wealth). This clustering of families can results in a vicious cycle of poverty, amplifying educational disparity in California. Two-thirds of students from low income families did not meet grade level standards in english and reading. On the other hand, two-thirds of students from high income families did. And connecting this back to how race is involved, the following statistic may come as a shock: “Only 2% of African American students and 6% of Hispanic students attend a high performing school, compared with 59% of white and 73% of Asian students.” In essence, we can’t say bad decisions make poor people, but rather people make bad decisions because they are poor. Breaking out of this loop is crucial. Another overlooked factor that goes into student education is parents. Poverty has a lot to do with how parents interact with their kids during the “critical period”, from birth to age five. California has attempted to address this challenge with its first five program (http://www.ccfc.ca.gov/). By age 3, for example, children from high income families are exposed to 30 million more words than children from families on welfare. This statistic is largely due to low income parents being forced to spend less time with their child because of work and have less disposable income to spend on reading materials (psmag.com/social-justice). One solution that schools can help facilitate is being more welcoming to all families to break the cycle of poverty. Another large topic of the module dealt with not only trying to focus students’ limited attention on academics, but also getting them excited and motivated to learn. The two main approaches to getting students motivated are either getting them interested or making them do it anyways. Making them do it anyways entails the use of extrinsic motivators such as letter grades, monetary bribes, etc. These have been shown to be useful at times, but the most long lasting positive effects comes from students being intrinsically motivated to learn. If you haven’t already read them, I wrote two articles that explore this issue: "The Disengaged Student Problem" and "A Classroom System Based Off Of Student Choice”. As always, thanks for reading this far. I’ll be back soon with another breakdown of this course. If you haven’t already, be sure to like and follow us on social media so you don’t miss exciting updates about what our organization has been up to!